'Tutankhamun: Anatomy of an Excavation' is the definitive archaeological record of Howard Carter and Lord Carnarvon's discovery of the tomb of Tutankhamun. 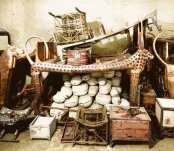 On November 5th 1922, Howard Carter wrote in his pocket diary: 'Discovered tomb under tomb of Ramsses VI investigated same & found seals intact.' The subsequent excavation of the tomb of Tutankhamun captured the public imagination. The complete records of the ten year excavation were deposited in the Griffith Institute Archive shortly after Carter's death by his niece Miss Phyllis Walker. This material is published here with full and free access, providing a comprehensive online resource for all audiences, from scholars to school children. One of the pioneering websites in Egyptology and archaeology, it has been running for more than 15 years and owes its foundation to Dr Jaromir Malek, the former Keeper of the Archive. As technology evolves, new presentation methods are being developed to assist all users in navigating this incredibly valuable resource.